No one tells you in graduate school to keep a sketchbook. In fact your professors won't even do those cheesy notebook checks to grade your content and thought process. Instead it's kind of an understood given fact of life that you, as an artist, should be keeping an active sketch book even if you don't "draw". For me however, sketchbooks are probably the hardest thing for me to actually commit to, aside from going to the gym on a regular basis; which I will never master. This whole past week I have been putting extensive thought into how I will continue making art in Ireland over the summer and all I keep coming back to is a travel sketchbook. Last year I had the opportunity to jump across the pond to London and I spent just over two weeks traversing the city for a second time in all it's glory. While there I took very little photographs, instead I wrote often and sketched the places and things I was seeing. I returned home with a book full of memories instead of just a couple of selfies, and my sketchbook is a work of art in itself. 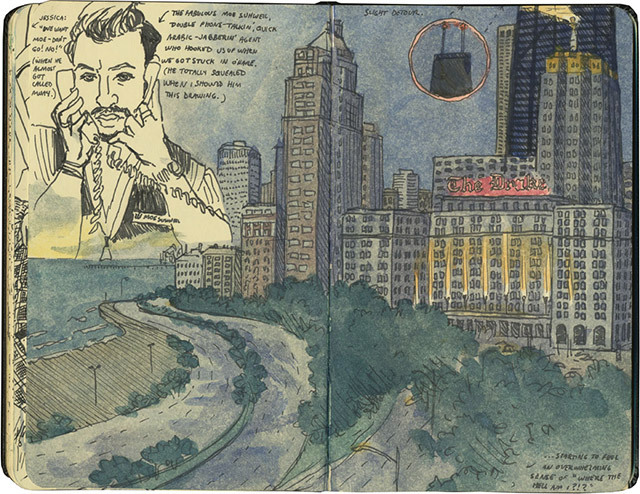 For centuries artists have been keeping active sketchbooks, so why is it so damn hard for people to keep them nowadays? I believe the answer comes in that we no longer write things down, instead we text it. We also don't see the need to draw whats before us because we can now capture it through few quick taps on a cell phone. We don't use our hands anymore, I am guilty of this just like anyone else. But I am going to change that, or at least try to. I think writing this blog, although it is electronic, is making me actually think about what it is I have to say; and most importantly is it even worth writing down. I was searching for exhibitions of artists sketchbooks and had a harder time finding them than I thought I would, seeing as how most artists keep them in some form or fashion. I found that a number of museums have a sketchbook or two of the artist on display, you know the famous ones like Picasso, or Monet. But I couldn't find any dedicated to todays artists, those making art right now. The Cantor Arts Center at Stanford University is currently exhibiting 29 sketchbooks of late abstract expressionist painter Richard Diebenkorn. For years his sketchbooks sat in a cardboard box in his home after he passed, and his wife pretty much was against letting the public see "such an intimate view" of her husbands works. I am completely with her on this, because my sketchbooks contain more than just drawings, they also contain vast amounts of writing. It would be giving my audience an in-depth view into how my mind works, and I'm not sure if I am up to that just yet. 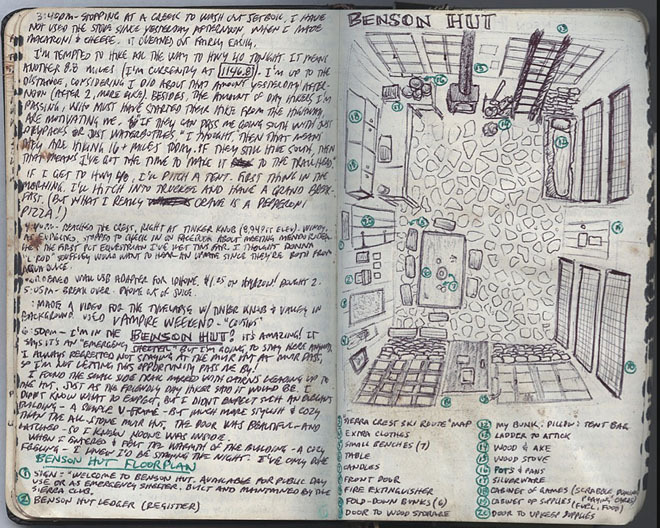 I also found The Sketchbook Project which was founded in Atlanta, but is now based out of Brooklyn, NY. It's an actual place where artists can donate their sketchbooks to be cataloged and digitized, then housed for the public viewing. It's a library dedicated to your thoughts, in New York, at the Brooklyn Art Library in Williamsburg...how else could you sketchbook live on for an eternity? I plan on donating some of my old sketchbooks to them as soon as I get the muster up to part ways with them. It's like letting go of a piece of yourself, and again, I'm not sure if I am ready for that just yet. The last type of sketchbook I found came from a group of people that hold a special place in my heart, and thats the trail hikers journal. 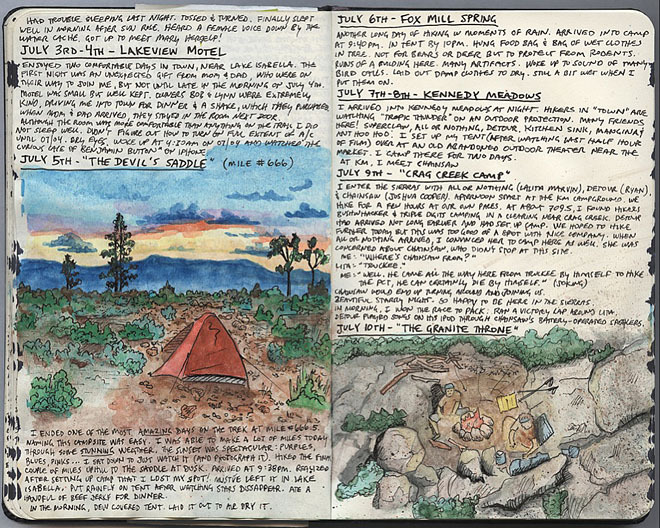 I know this sounds a bit off topic, but if you have never seen a trail hikers journal or sketchbook, you are missing out on some of the most honest and real types of writing there is these days. See I plan on hiking the entire Appalachian Trail, all 2186 approximate miles when I graduate school. I was going to start hiking it this year in January 2016, but I was accepting into a graduate program, so now the plans have been delayed for a few years, but it's still going to happen. 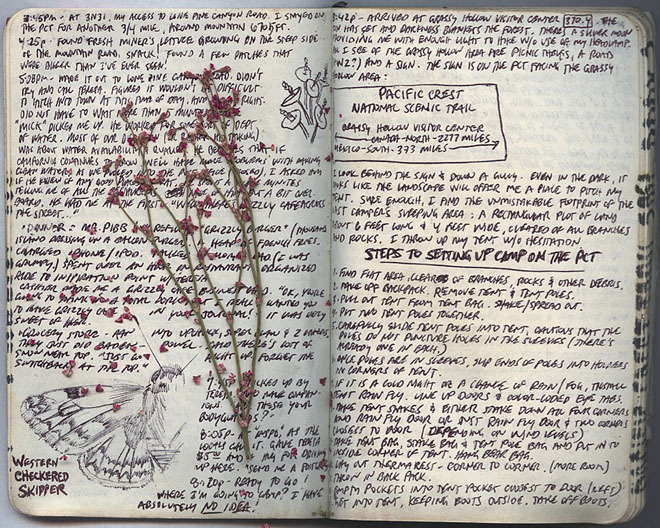 Artist and hiker Kolby Kirk made this journal on his hike of the Pacific Crest Trail, another trail I hope to tackle one day. 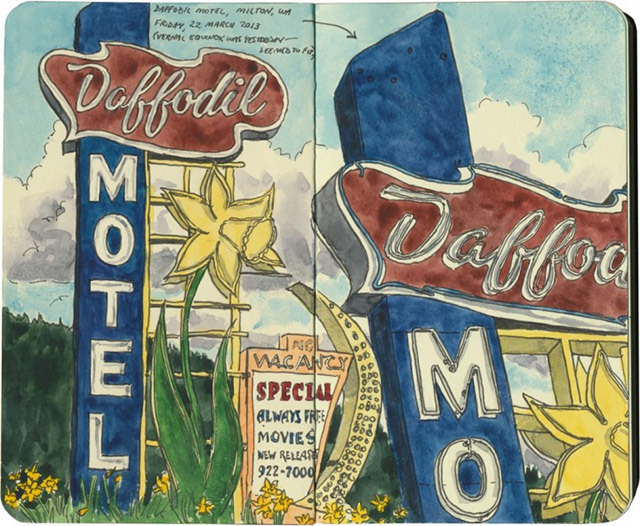 And artist and illustrator Chandler O’Leary, the watercolor sketchbooks featured at the top, has traveled extensively around the United States documenting her travels in a way that basically replaces the need for photography all together. Just the idea of being completely unplugged from the social side of things makes these sketchbooks so real, so powerful to read. They have seen the miles, seen the pain, seen the days. I think If I keep a log similar to these on my Ireland trip, I will return with a real understanding of what it means to try and make art abroad, out of my comfort zone, without any of my usual materials.